Saw Cut Anodized Aluminum 16g 7/32" ID from a starter kit on the website. Made a choker that fits me very nicely with a lobster claw clasp. Trying to make a square sheet with the ultimate goal of a heavy chain shirt weaved with 4 in 1 is another story. I think I need bigger rings to start out. I really enjoyed opening and closing the two or three hundred rings, but then beyond a line or two of weaving, I get stuck. 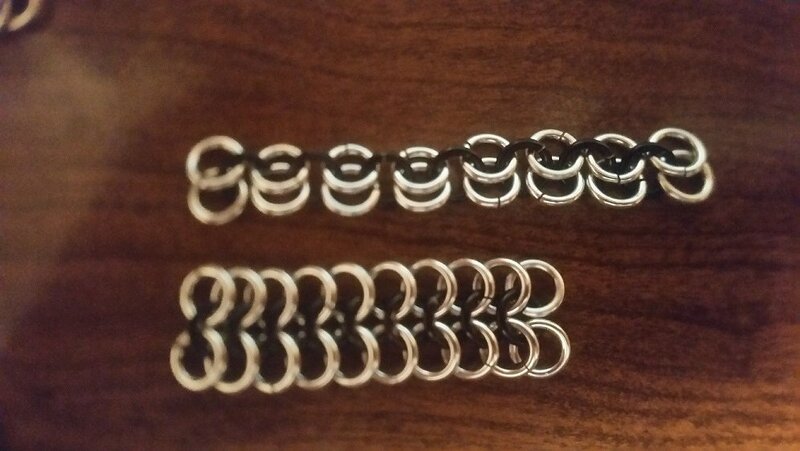 I feel the rings are too small; I get started doing more columns or rows but it stops working out. The starter guide pdf that was linked with my first order has a table that shows what projects that different rings are good for. I determined I should try out some 14g SWG 5/16" ID 4AR stainless steel machine cut rings. 14g stainless fights back! You'll be surprised, especially after working with aluminum. I suggest getting a variety of sizes and materials to play around with and see what you like. I love the look of stainless for stuff, and it's not as dirty as aluminum (if it hasn't already, aluminum will start leaving black marks on your hands and clothes it's annoying), but I don't really like to work with stainless often in anything larger than 16 gauge because it's tough stuff. Granted, I've got small hands and typically work with jewelry, so it may not be a problem for you. If you commit to making a full shirt in 14g steel, I recommend getting modified pliers. You can grind them yourself or buy them from TRL. Archmaille is right, steel starts fighting back that gauge, even if you do have big hands. You'll work faster, get better closures, and lower your risk of injury. 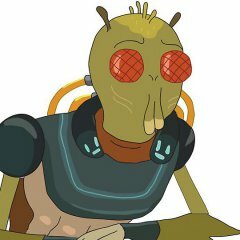 Welcome and well come, KrombopulosMichael. With steel links, be sure to use enough pliers. Wide jaws, large enough handles for leverage. Stainless is stiff and takes power to bend it open or closed. Your links in your pic, with an AR about AR4, are plenty large enough; I think your trouble with E4-1 lies elsewhere than your link size. Larger links are rather easier to see and keep track of. See that one link in the lower right corner of your mailpatch? That needs to swing around so it lies just like the other links in that row. The silver link directly above it hasn't been woven through all of the black links it needs to and consequently is not in position. Don't pick your patch of mail up off your worksurface at the beginning. Leave it always on the table and slide your next link to be put on it up to whichever edge you are working on. This is easiest on the edge where the links angle up off of the table surface -- the edge nearest your finger. 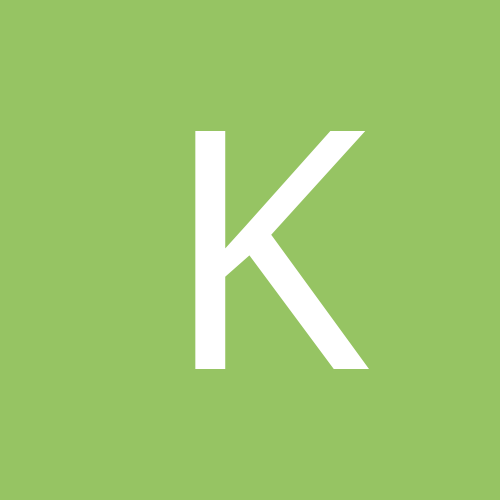 Your mailpatch will get more stable as it gets larger, and then you can pick it up with less derangement. But at the beginning, the links tend to flop around and get out of their proper position. 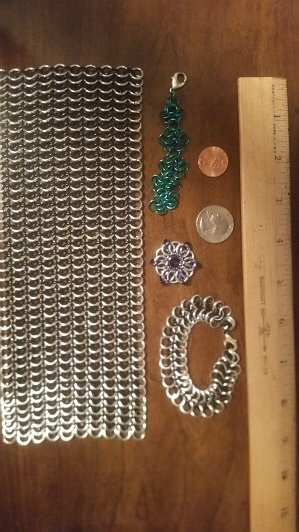 See also my posts about how I start a patch of E4-1, using a chain of alternating single and doubled links to begin one edge, 2 links 1 link 2 links 1 link, 2 1 2 1... and ending in 2 links, whatever length of chain you like. Thank you for all the advice! After a couple more nights of stubborn practicing, I finally saw that I had the whole thing 90 degrees off. This picture illustrates the before and after product and a powerful eureka moment for me. Now to make 4 more strips like that and connect them together as I was trying to do with the top one. Feeling accomplished. Look at those sloppy gaps! 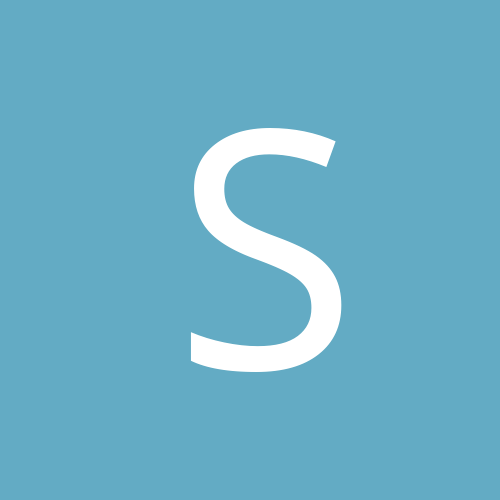 You can make mail in either direction, along a row or along a column. One ring at a time (abbrv: ORAAT) or a couple-three at a time, depending on where you are in your mailpatch. Feels good to see the rows zipping on two by two instead of one at a time. Gapped closures you can fix by taking hold of a link across its diameter, the pliers 180 degrees apart, twist to open and twist to close, like you're revving a motorcycle. =O= and rotate the pliers a bit; bends it right open. And closed again. This allows you to easily horse the ends together with some inward pressure as you twist it closed, until the ends grind on each other. Grind 'em together and stop when they are lined up so the link lies this flat on a surface: =====. A nice neat little ring, IOW. 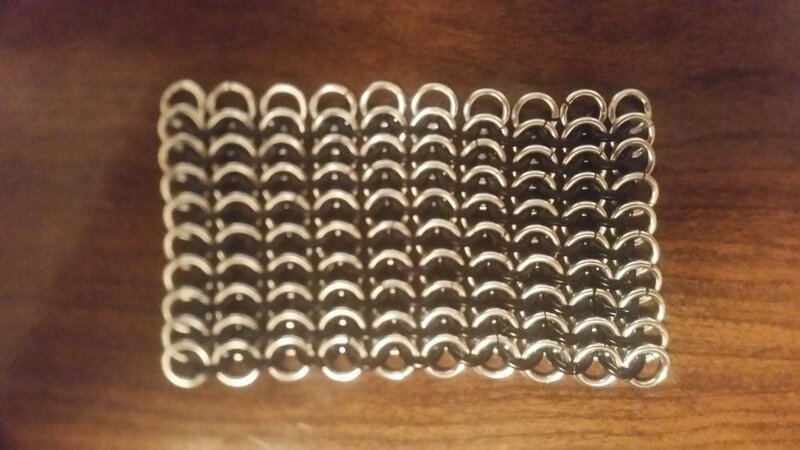 Alright guys, I'm going to put together the rest of these 1800 aluminum rings to make sure it's flexible enough for a shirt. The swatch in the picture is 600 of them, I'm gonna make sure I know how to taper the pattern for the arms and neck of the shirt.. Any tips? 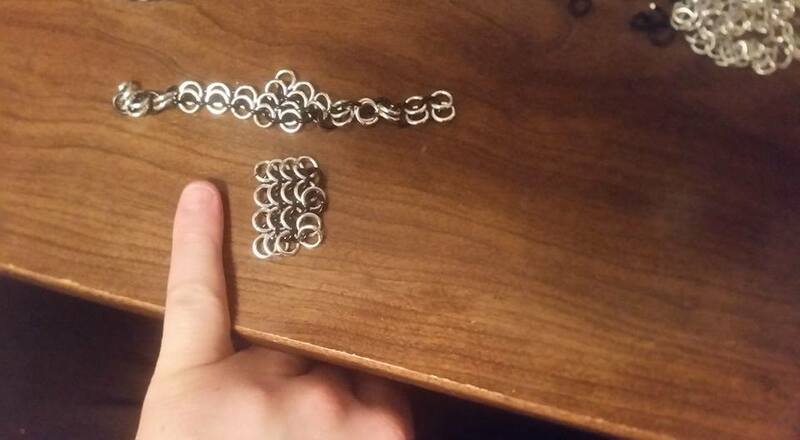 That's 90 bags of 400 stainless steel rings. 36,000 rings weighing 30 pounds measuring 9 square feet of euro 4-1. Exciting! 600 rings in the 4-1 below, and I made a roseweave pattern with the flimsiest rings from joanne fabric, it broke in half. The Celtic Star made me proud, too. Burn me! The Wheel weaves as the Wheel wills. I have work to do. You probably see by now that going either way works just fine. Your upper chain is the easiest one to add a lot of links onto; see how the edge nearest you has its links angling up, pointing at your chest? Convenient (I just came within an ace of typing 'convfefe' with fumbly fingers) to slide more links up to it and weave them in along there. You probably rotated your lower chain 90 degrees and stuck it on the upper with a single link to make an L shaped piece you filled in to make the rest of the square in your other pic. Bumping my original post, as I'm nearing completion of the shirt I began last February. The milestone here is that I wore out the teeth on my pliers, so I placed a rush order for new ones. A few more hours work and then I will zip up the sheet into a tube and attach shoulder straps. Filling in the collar area feels daunting to me. I've never weaved ORAAT, but I have a high comfortability with the 4-1 pattern. I think I will have a couple thousand rings leftover, so I'll make some sleeves, too. I better take a look at my original calcs and compare that to the actual square footage of this giant 4-1 sheet. When you attach the straps, make the distance between the shoulder straps in the back about 4" wider than the distance between them in the front. And before you zip up the body tube, would you be willing to post X/Y measurements and row/column ring counts of your giant rectangle? I'm not sure the TRL number on rings/sqft for 16g 7/32" is accurate. Last time I plotted all the rings/sqft data, that data point looked out of place. Would you like me to count the columns and rows by 4-1 units like illustrated below? Edit: If so, it is 27 rows by 119 columns. When completed I will measure it's length and width by imperial and metric units. 18 13/16" x 51 5/16"
Check my math, please, trl wizards. This link is how I'm doing them. I really wish I had taken the extra time to learn contractions and expansions. Next shirt! Now I fill in the collar and the back OORAT. Any tips, comments, suggestions, flames welcome. I haven't worked on this in awhile. The sleeves and collar are all that remain. I have this beautiful giant tube of maille. Finishing this is daunting me. I can't find any good youtubes and I feel like the picture above is all wrong and the straps should actually hang the same orientation as the rest of the shirt. The straps can be made in the same direction as the main body, at a 90 degree angle as you have done, or at a 45 degree angle. It's all up to how you want the final product to look. It would be worth it to sit down for a few minutes and make a rough sketch of how you want it to look when finished, so that you have a clear image in your head of how to proceed. This shared album is mostly scale, but there is one picture of a mail shirt where I did narrow 'straps' hanging closed and attached hanging closed sleeves at a 90 degree angle. It's tough to tell in the picture, but the sleeve panels run opposite directions of each other to minimize the seams. The first row of rings attached at 90 degrees to the body overlap bottom to top. On the far panel, the 'same' row overlaps top to bottom. I'll do a search for more pictures and upload them to this album, if I find any, this weekend. It doesn't fit well, mostly because I'm fat as hell... One good thing about my construction, It's just the right length! I dream of making another, heavier, shirt with a dragonscale weave. This one does not have any contractions or expansions, and I have yet to fiddle with anything with any level of skill.